As many know, an RV garage can protect your RV investment from sun and weather damage. When your motorhome isn’t on the road and traveling, an RV storage building is the best way to protect the look and shine of your RV. Unprotected outdoor storage will diminish the RV paint and turn it to a dull, ashen color over time. UV rays will color your interior fabrics. And of course, any winter snow load can create leaks and possibly do structural damage as well. So when our customer in Roy Washington came to us looking to build an RV storage garage with shop, we knew all the reasons why he wanted it. It just made good sense. 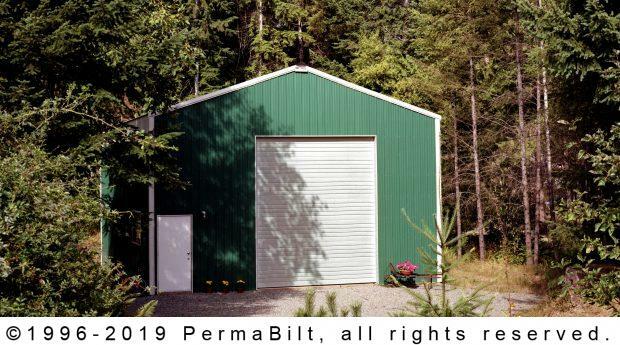 Meeting with our PermaBilt® Building Representative, our customer reviewed what elements he would need to complete his new building. He chose a popular design with a 28’ end wall which has both a garage door and an entry door. The building was 34’ long to accommodate his RV and then some. Upon completion the owner was excited about getting his motorhome undercover just before the autumn weather arrived.